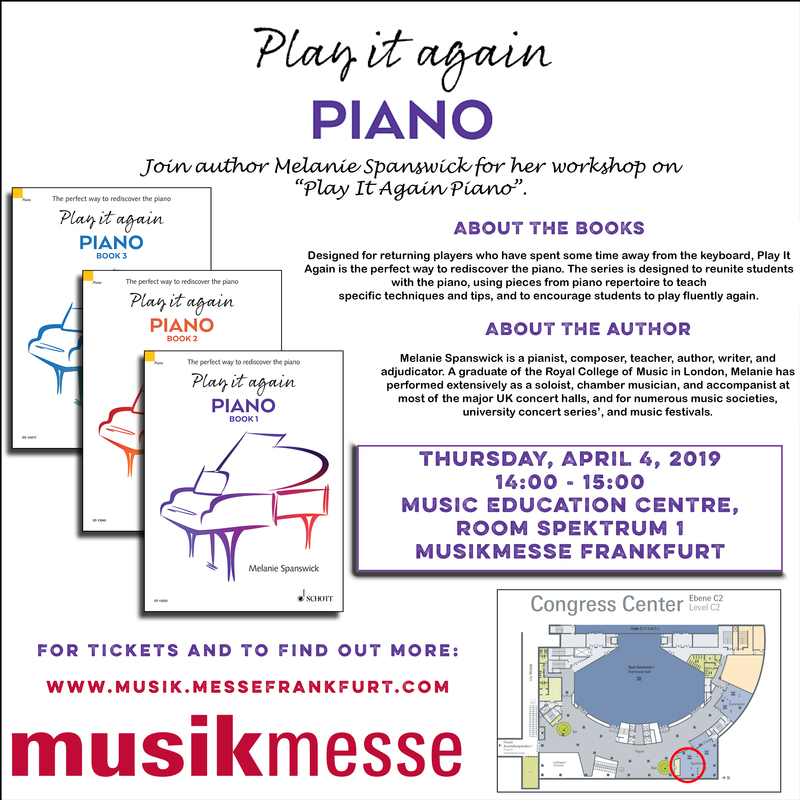 I’m really looking forward to giving a presentation and workshop at this year’s Frankfurt Music Fair or Musikmesse which takes place from April 2nd – 5th. My workshop will be held on Thursday April 4th at 2.00pm. This presentation focuses on Play it again: PIANO Book 1, 2 and 3. Book 3 will be officially launched next week at the Fair, after which I’ll add links as to where it can be purchased for those of you who have kindly enquired. I very much enjoy giving workshops and presentations. They nearly always include references to my books, and this one will be no exception. I’ll start by speaking about all three books within my piano course, which, as many readers know, is intended for those returning to piano playing after a break. The workshop highlights the importance of developing physical flexibility in piano playing, with audience participation and some relaxation exercises too. The new addition to the Play it again course, Book 3, begins where Book 2 stops. It takes students on a journey from Grade 8 to the Associate Diploma level, via the new Post Grade 8 Diploma. As a quick recap, Play it again Book 1 is approximately Grade 1 – 4 level, and Book 2, Grade 5 – 8. Each book contains a collection of pieces mostly selected from standard repertoire. There are twenty-eight pieces in Book 1, and twenty-one in Book 2. Book 3 features eleven works by a variety of composers and genres, with copious practice notes for each piece (some pieces have up to 8 pages of notes). It’s possible to form a Post Grade 8 Diploma or Associate Diploma programme from this book. Book 3 will be on sale at the Frankfurt Fair, and I’ll be publishing a much more detailed survey of the book next week. If you would like to attend my presentation, you can find more information here. I look forward to meeting you.